For a few weeks now, it’s been assumed that Brad Penny would be the odd man out in the overcrowded Boston rotation. Brought in on a one year deal as something of a reclamation project, Penny didn’t get off to a very strong start, and he was standing in thew ay of youngsters Justin Masterson and Clay Buchholz, which didn’t exactly endear him to Red Sox nation. With John Smoltz making his way back, trade rumors have been swirling around Penny for weeks. Over his last four starts, however, Penny has been pitching like a guy who wants to stick around. That’s a 3.37 FIP over his last four trips to the mound, the last two of which were against the Rangers and Yankees. 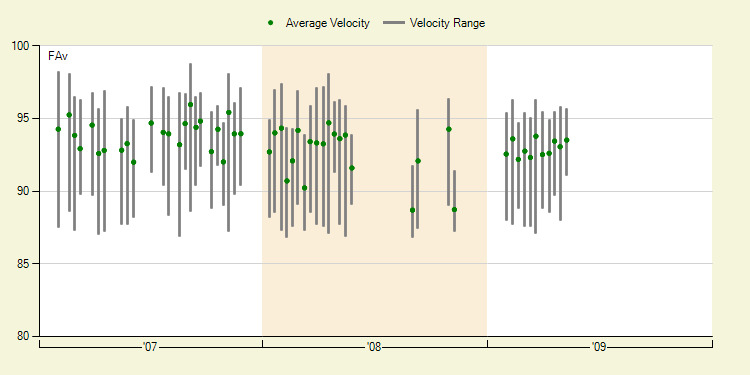 It’s not just his performances, either – take a look at his velocity chart. His fastball is trending upwards as the season has gone along, suggesting that the improved results aren’t just a good stretch but perhaps indicative of Penny returning towards his previously established performances when healthy. He probably never will get all the way back to what he was earlier in his career, but he’s showing that he can still be a quality major league performer, whether its for Boston or someone else. We’re past the point where Boston fans should be happy to see this guy go just so he can make room for the other starters in the organization. Penny’s spent the last few weeks proving that he still has value, and it will be interesting to see how Boston handles the situation. We hoped you liked reading A Penny Saved by Dave Cameron! Sure he may go higher, but at some point you need to think you have reached enough ROI. Find a replacement for Ortiz or get a catcher for the future. Ortiz has had a fairly good week, but I don’t see it continuing. Papelbon kind of scares me. 4.05 FIP, dropping K/9, 95% LOB, and he does not throw his splitter anymore. At worst Smoltz would be a fantastic set up guy. Decisions indeed, though I imagine they’re good dilemmas to have. Not only do they have too many starters, they’ve got guys in Smoltz and Masterson who’ve shown they can be either starter or reliever, though for Smoltz, it’s mostly a matter of historical ability. For now, they’ve got a good thing going and can afford to deal Penny, but who’s available? I know starting pitching is always in need, but who can they get in return? Catcher and shortstop being premium positions, they’re rarely available, and will the Sox take on a 1-1.5 WAR type of hitter, stick him at DH, and bench Papi? Can you get any more than that from Penny?